4 Bedroom Detached House For Sale in Chesterfield for Offers in the region of £825,000. Realistically Priced! Please Call The Office To Arrange A Viewing Of This Unique Property Offering Superb Potential. Have you ever dreamed of waking up to endless views, whilst still being a stones throw away from local amenities and fantastic motorway links! Escaping the rat race and relaxing in the charm and beauty of your own home. Why not have the comfort of your home and be able to run your own business or holiday let? 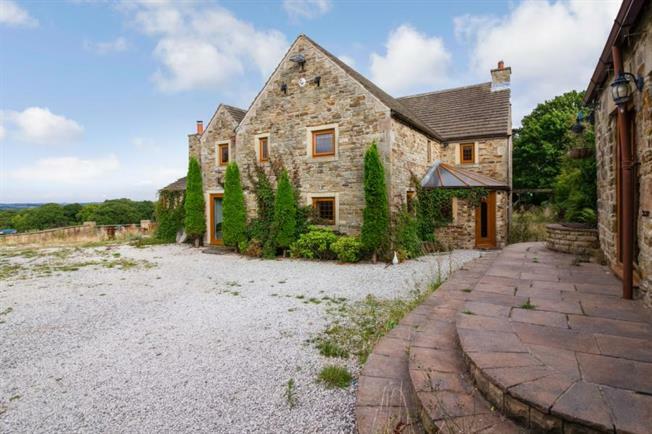 This characterful four bedroom detached farm house has it all! Driving up the long driveway to the secluded farm, you're welcomed with a separate office space, two double garages, three stables and tack room and a two bedroom cottage wasn't enough, there's ten acres of land to play with! The main Farm house is in need of partial renovation due to minor flooding but could be a stunning family home and a fantastic business opportunity. This is the perfect opportunity for someone to add in their own value and be able to run their business at the same time! Downstairs the main farm house benefits from two multi-fuel burners, a large kitchen diner, three reception rooms and an additional conservatory with a newly fitted downstairs WC. Upstairs the property boasts four large double bedrooms. The master bedroom has built in wardrobes and dressing table with enough space for a super king bed, complete with en-suite shower room. The second bedroom also with built in wardrobes is complete with en-suite shower room. The third bedroom has a small dressing area and access to the large loft space, or ideal play room for the little ones! Outside in the courtyard is access to the large office space, attached to this is the 2 bedroom cottage, an ideal Holiday let or perfect for the additional family member. Briefly comprising of a small kitchen, living dining room and 2 double bedrooms along with bathroom. This is in superb condition and could be lived in whilst doing the main farm house up, or alternatively could be rented out for additional income. If this wasn't enough there are four garages, four stables and ten acres of land, perfect for the equestrian lover! This property is one of a kind and has so much potential to make it a lovely home and an ideal business prospect. Call Blundells now to view.